Is selling flights already your daily business or are you perhaps still in the planning stage? Topics such as IATA NDC, the distribution of ancillaries, dynamic packaging or process automation spark your interest …? 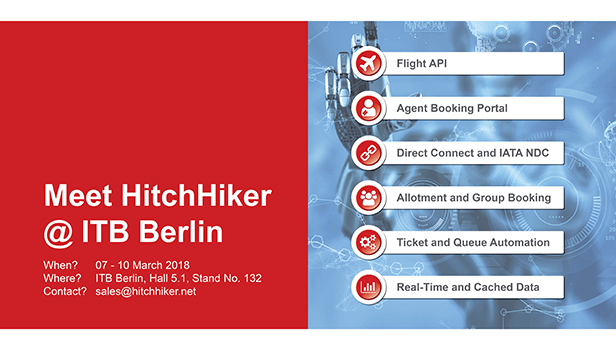 If so, then you are cordially invited to visit us at this year’s ITB in Berlin, where our team of experts would be pleased to take the time to answer any of your flight-related questions as well as to gain initial insight into your own individual project. With 26 years of expertise in the digitalization of flight booking processes and the resulting software products developed therefor, we would be delighted to be able to contribute to the solution of your own business challenges. To request an appointment, please call us at +49 69 507030 or send an e-mail to mailto:sales@hitchhiker.net. For more information on our company and on our products, please visit our homepage: www.hitchhiker.net.